The work of a multi-genre novel can be difficult to balance. Mainstream detective fictions routinely entertain whiffs of the supernatural amid domestic plots and nail-biting whodunits; urban-fantasy thrillers, meanwhile, are more often promoted primarily in light of those supernatural elements. This can create a significant disconnect between branding and content when an author is also seeking to advance the quotidian in their protagonist’s life. Angela Slatter’s second Verity Fassbinder novel, Corpselight, faces just such a challenge in genre positioning. A proudly Australian and eloquently told addition to the urban-fantasy wheelhouse, this sequel seeks an audience with back copy and cover art that promise a gripping tale much in-keeping with the rousing series opener, Vigil (2016). However, more so than in Vigil—set in a richly layered universe, and arising from the archetypal tale of a person caught between those two worlds (one, the “Weyrd,” filled with all manner of spook and demon, the other, the “Normal,” mundane)—the pacing in Corpselight does not always meet expectations for a supernatural thriller. 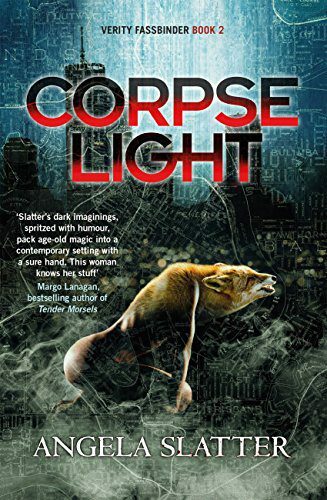 In part, Corpselight’s cadence reflects the expository challenge of any sequel: namely, to keep the reader apprised of critical backstories developed at greater length in the initial volume, while centring the reader’s attention on more immediate narrative intrigues. Slatter’s first person narration makes this approach especially vital since it is essential to maintaining the protagonist’s believability; but its consequence is a range of lengthy asides interrupting the action in which our narrator explains why a given piece of information about a core character or plot event might upset her—and this necessarily comes at some cost to the overall clip of the book. Likewise, Slatter’s choice to construct a sequel that ends with extensive set-up for the crisis of a third novel, instead of a sequel that can stand fully apart from other Verity Fassbinder adventures, yields a closing beat that runs for some sixty pages in a whole new setting. However, the greatest impact on the pacing of Slatter’s sequel seems to emerge from the author’s clear prioritization of non-detective and non-fantastical narrative elements, which include the integration of pregnancy, childbirth, and day-to-day familial responsibilities within the scope of the more exotic life experiences available to our mystery solving, beastie battling protagonist. To this end, V, our half-Weyrd investigator of disturbances in the delicate balance of Weyrd/Normal-world affairs, begins her tale thirty-two weeks into a pregnancy that will reach its conclusion in under one hundred pages, leaving the ensuing two thirds of the text to navigate in large part (and amid the story’s core mysteries) domestic life with a newborn. In this overt effort to foreground the mundane aspects of Slatter’s universe, V’s Normal partner, David, becomes a literary provocation precisely because he carries none of the tension building baggage of detective fiction’s usual romantic interests. Rather, he is perfectly supportive of V’s decisions, always respectful of and deferent to her experiences, one hundred percent engaged in his daughter’s life, and invariably up for a good cuddle after V’s adventures. What tension exists in their relationship thus manifests more in V’s fear that David will criticize her for the risks she takes, and her effusive, how-lucky-am-I appreciation for how wonderful he is in response to her needs. Even a life threatening (and for one character, fatal) encounter near the newborn’s room only serves as an affirmation of V’s knowledge and abilities, and leads to further family bonding over the application of henna-based wards against future attacks. Near the end of the book, V receives an (entirely incidental) chance to talk to Jerry on his journey through the afterlife, but, in the immediate wake of his death, the treatment of the loss is minimal, in part because the story veers sharply to the invasion’s greater implications for the safety of V, David, and little Maisie. Now, a flawed protagonist is, for this reader, a welcome concession to the complexity of human experience, but a judging character tends to work best, even in first person narration, when some element of the story still offers space for readers to opt out of that character’s prejudices. However, even in low-stakes scenarios—such as V and David’s chapter opening, wink-and-a-nod derision of Zack Snyder’s Man of Steel (2013) and Batman v. Superman: Dawn of Justice (2016) (p. 59)—Slatter assumes an audience that implicitly and fully buys in to V’s worldviews. The narrative assumption of perfect agreement with V’s views might make it easier to excuse some of V’s more inept moments as an interrogator, but it does little to establish V as an investigator with sufficient people skills for the bulk of her work—and further deflates the possible tension of a late stage challenge offered by one particular character in the underworld. Rather than V coming to terms with her escalating anger and its consequences, she simply finds her potential nemesis doltish for thinking he could so easily sway her to his side through that anger: a lapsed opportunity for the book to invite more self-reflection and personal growth. This is also a book that bears the signs of beta-reader vetting in its careful and extensive inclusion of a variety of pregnancy markers, which might explain why some references feel more like “in” jokes than invitations to a broader readership. None of this is to suggest, however, that Slatter is not an attentive and engaging writer of a book with many beautiful turns of phrase, and a clear attention to detail. Corpselight offers immense clarity in its development of the Weyrd universe, and its characters’ backstories offer refreshing extensions of fantastical mythologies and their local infrastructures. Moreover, there most certainly is an audience for works in which female protagonists can operate in active community roles without having to “prove” themselves on the home front, or achieve professional excellence without inevitable cost to their relationships—and not just as part of any book’s fantasy worldbuilding, but as perfectly plausible realities in the here and now. To this end, the sheer existence of a partner like David—who may not have much in the way of a life outside his domestic roles with V, but who also presents no threat of divorce, affair, or strain from competing interests—is not, intrinsically, to be taken as a narrative flaw. Rather, the relatively minor slings and arrows of a well formed adult partnership, a properly supported pregnancy and post-natal transition, and the related push-pull of everyday family life, suggests a text that is eminently confident in the ability of urban fantasy—even of the detective subgenre—to entertain without necessarily thrilling in the traditional sense. We certainly permit no less than this sort of thing in the world of mainstream “cozy” mysteries, so, even if the third book in the Verity Fassbinder series takes a hard swing from family life, Corpselight deserves either promotion that better reflects Slatter’s narrative priorities, or—if the counterpoint will be that such branding simply attends to the demands of the marketplace—a reading public more open to the idea that some of life’s most extraordinary adventures, in urban fantasy as much as any literary mainstream fiction, must arise around the people who become our homes.